This two-level facility is suitable for activities and meetings for small groups or, in conjunction with the lovely ‘Village Green’ - a flat grassed area adjacent to the hall measuring approximately 15 x 30 metres - would be suitable to erect a marquee for weddings and larger functions. The upper hall is open-plan area with wooden floor, suitable for up to 70 people. It has been successfully used for art exhibitions, pop-up stores, and zumba, chi gung and yoga classes. 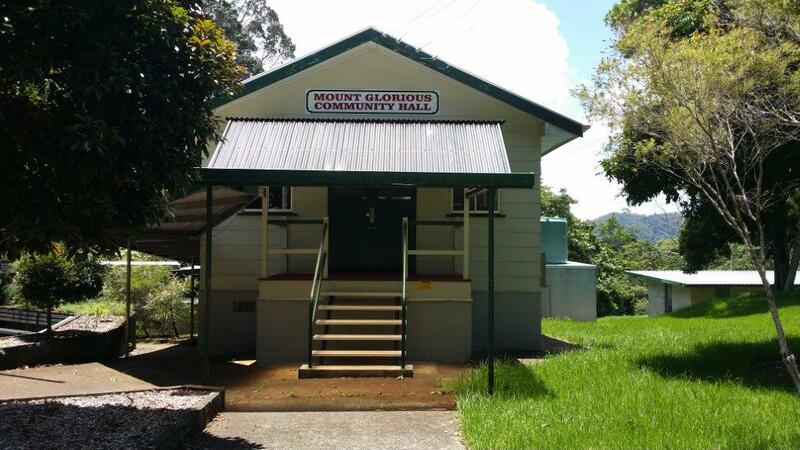 Professional, gallery-style display materials are available for hire from the Mount Glorious Community Association. Downstairs is a smaller area seating 40 with a large commercial kitchen which is easily accessible from the Village Green. The downstairs hall opens onto a pleasant outdoor seating area. The Hall and the Village Green are situated on 6 hectares of beautifully restored rainforest adjacent to the Maiala Park section of D’Aguilar National Park. The toilet block is external to the main building. There is no disability access to the upstairs hall. While there is a pathway to the lower level and amenities, it would be advisable for hirers to view the facility to ensure access is suitable for their participants.